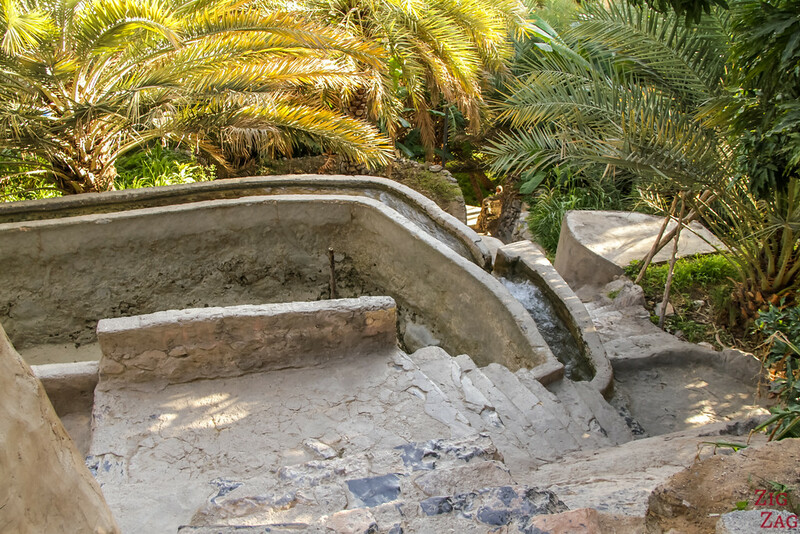 Misfat Al Abriyeen Oman, and its famous Guesthouse Misfah Old House, have become a great stop when touring the Sultanate. 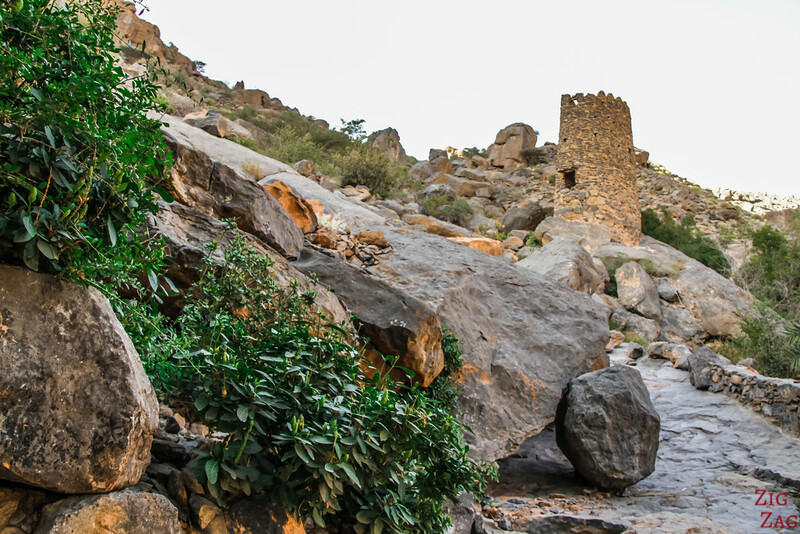 It is considered one of the most beautiful villages in the country. 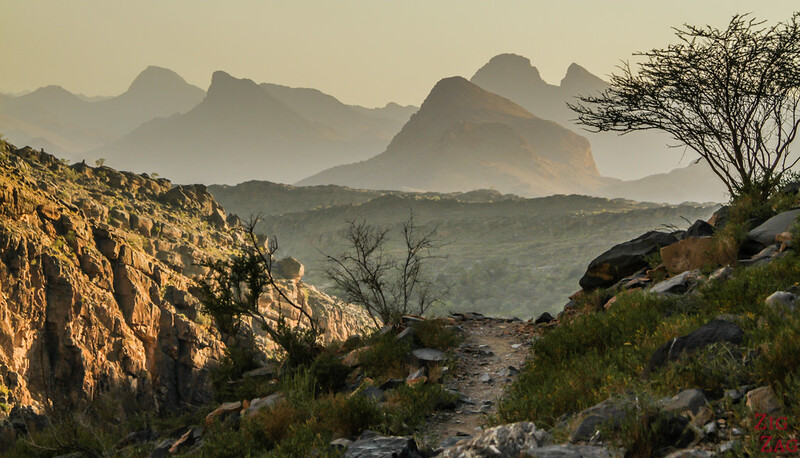 It offers a relaxing break from towns and is a great place for those who love hiking. 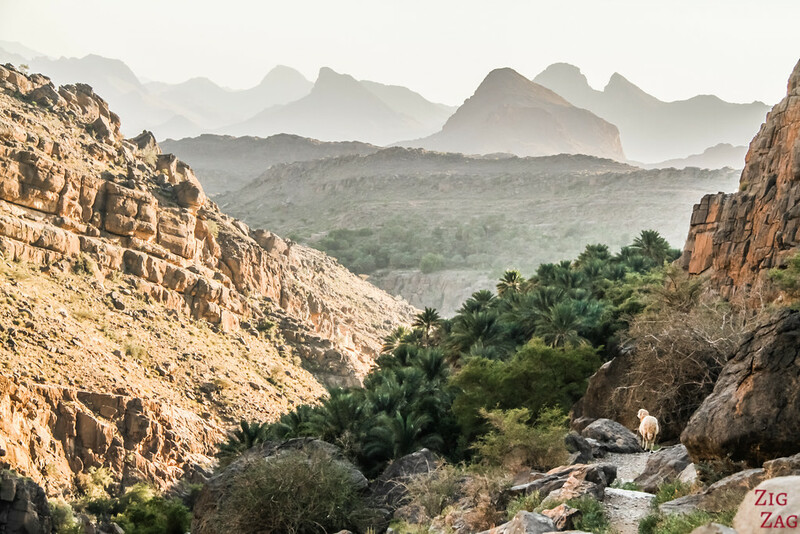 Misfat Al Abriyeen has become attractive destination for tourists touring Oman due to the agricultural terraces, beautiful wadi, hiking options and old houses. 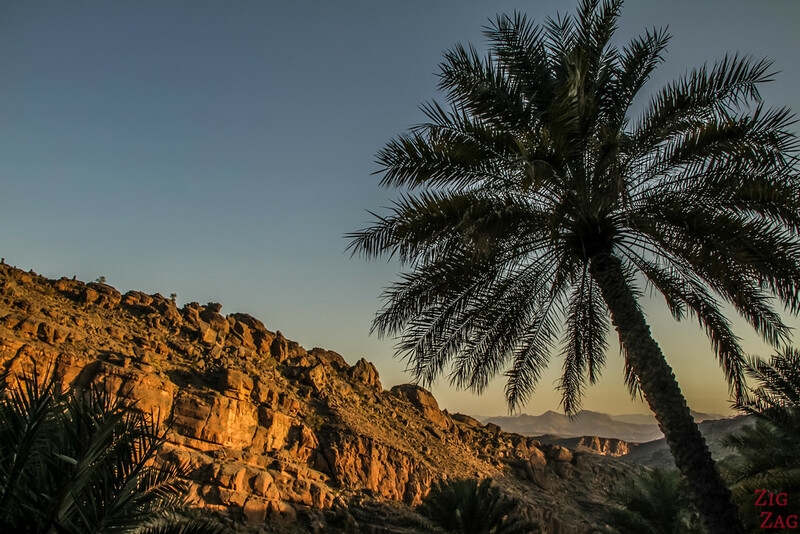 As Oman Tourism describes it: The homes of its inhabitants are at the top of the mountain and their farms are on the slope. 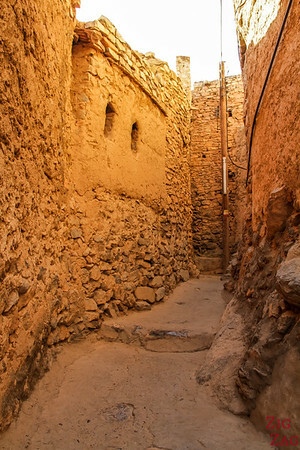 The village rises around 1000 meters above sea level and is named after the original inhabitants, the Al Abri family. Many more photos after the practical information. 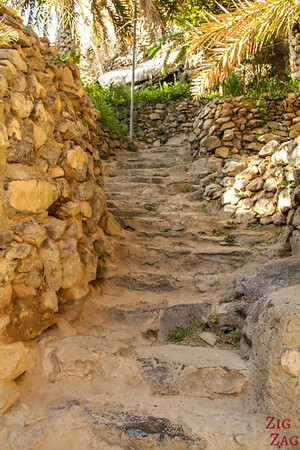 Not far from Al Hamra, the village is well indicated. 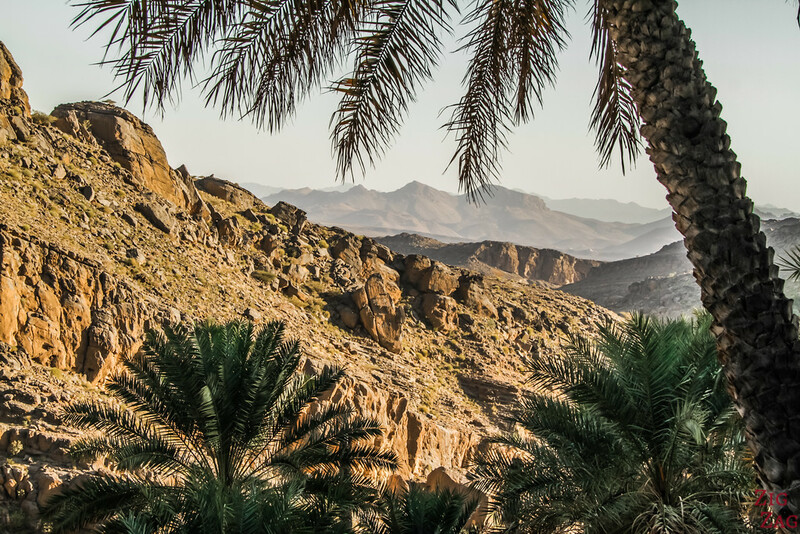 Misfat al Abriyeen, along with many other beautiful places, is included in my eBook: Experience Oman. Book accommodation in advance. The village is small. 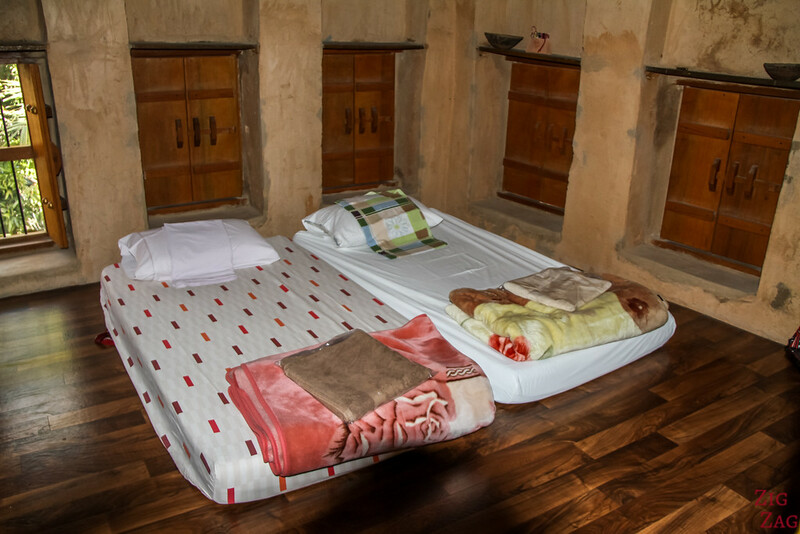 The main guest house is Misfah Old House which you can find on all the booking platforms. See my description at the end of this post. Or visit during the day. 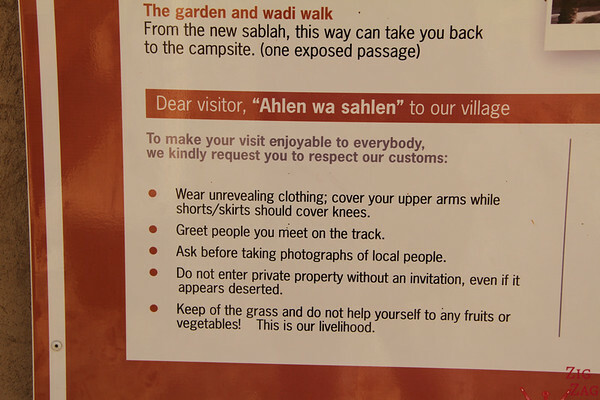 At the entrance of the village, you can read the rules on behaving in the village so as to be respectful of the locals. 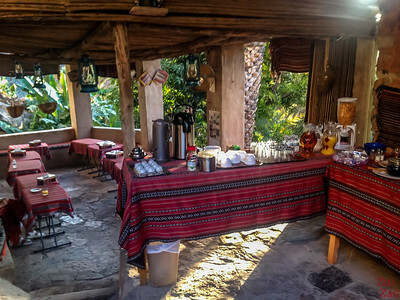 I recommend a first stop in Modern Misfah. From the road above, you have a nice view of the old village lost in the plantations. 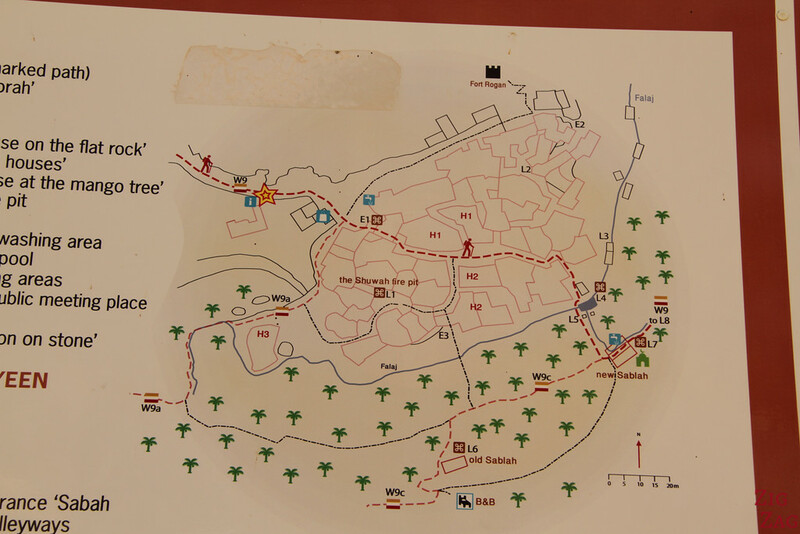 At the entrance of the village there is is a map o the village, the points of interests and the ailing trails. 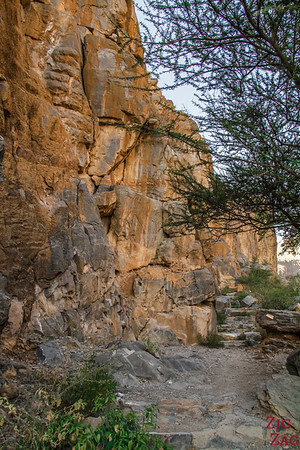 You can also hike up to the fort or complete loger hike joining other wadis. You can find a little bit more information about the construction of the village on this article from the Daily Observer. I had only a couple of hours before sunset so I decided to do W9. 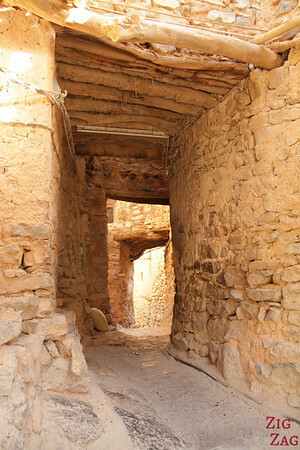 I first explore the alleys of the village​. The place is so peaceful. I was lucky that almost to tourists were there at the same time as me. It was like traveling through time. 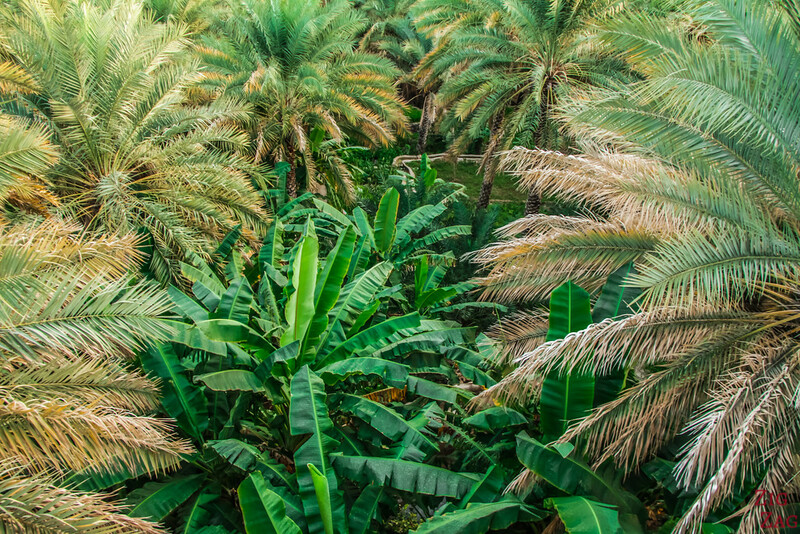 There are various plantations. 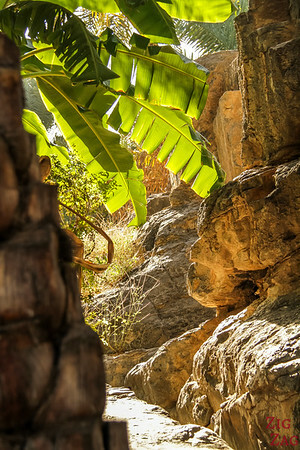 Many grow bananas. 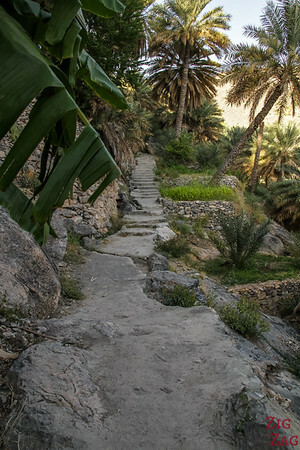 Oman Tripper has also a couple of photos of the village. 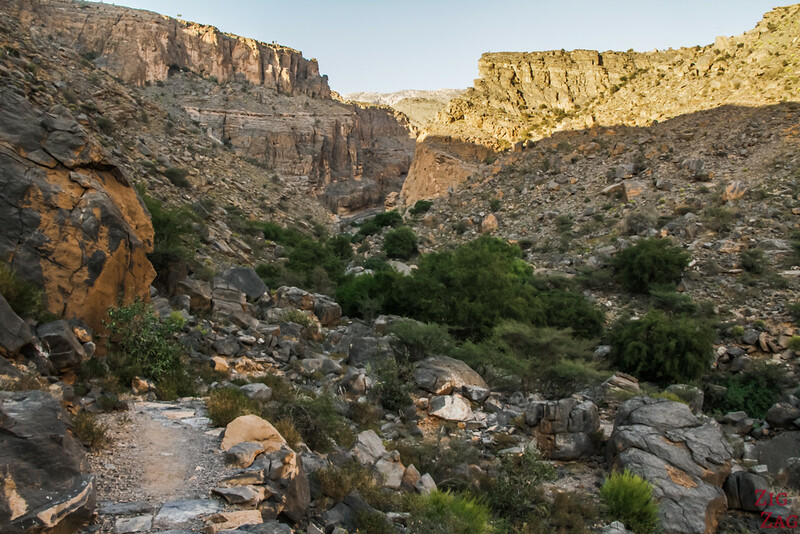 I continued on the path along the wadi. 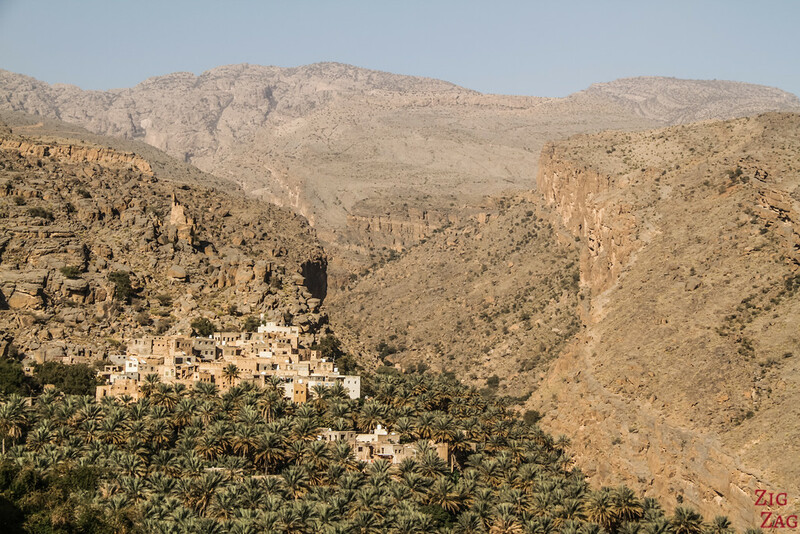 The Falaj spreads through the slopes of the valley to reach all terraces. The path continued so I decided to walk a bit further. 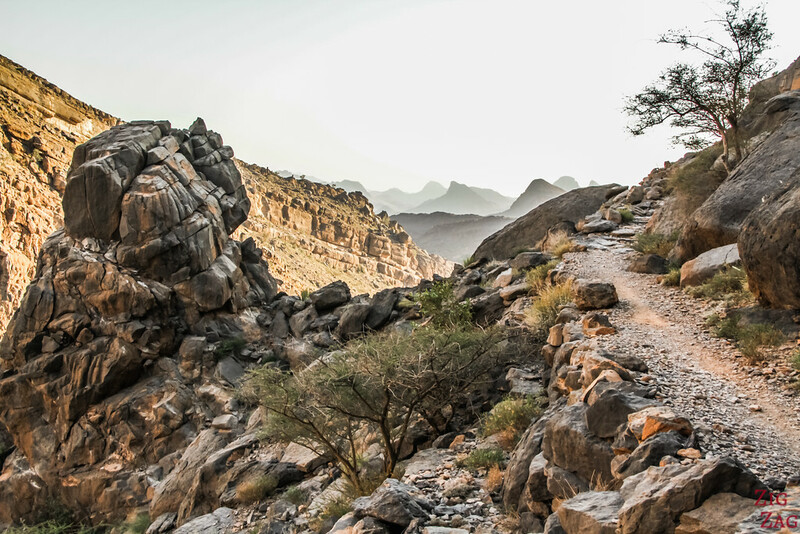 I think W9 is a longer trail between wadis and you can do a small portion in the village. I crossed path with sheep which were on the path getting back to the village. We all stopped and looked at each others. They did not know what to do. I moved forward and they turned around but stayed on the path. I walked further and they finally scattered except for their leader. After a while it also moved to the side and I was able to pass them. 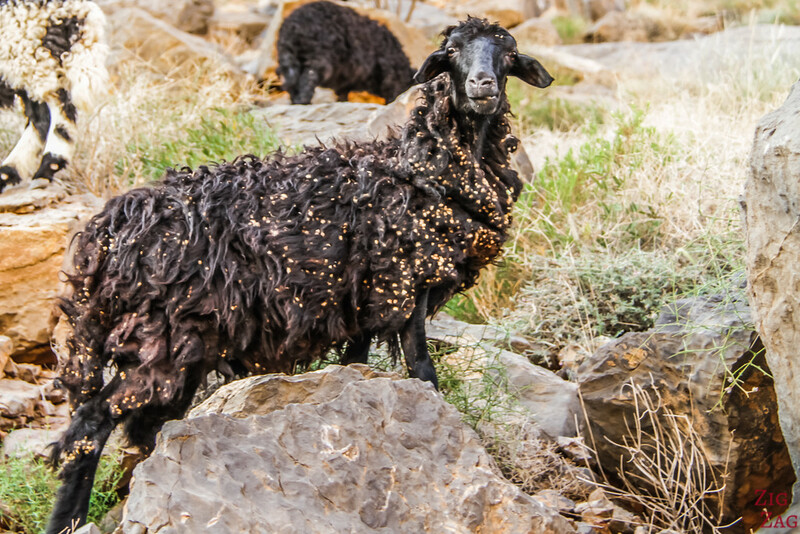 I then turned around and saw all of them back on the path and following their leader back to the village. What a strange encounter! I walked all the way to some large rocks before deciding to turn around in order to be back before sunset. I really enjoyed my walk back with some great views of the mountains. Have a look! The views were incredible wiht the sun getting down and the strange looking mountains at the back. 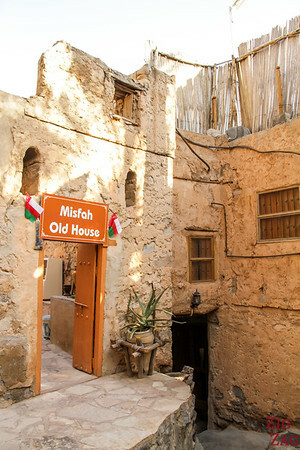 If you are wandering where to stay in Misfat Al Abriyeen, the main guesthouse is Misfah﻿﻿ Old House. I recommend staying there and enjoy the peace and quiet of the village. 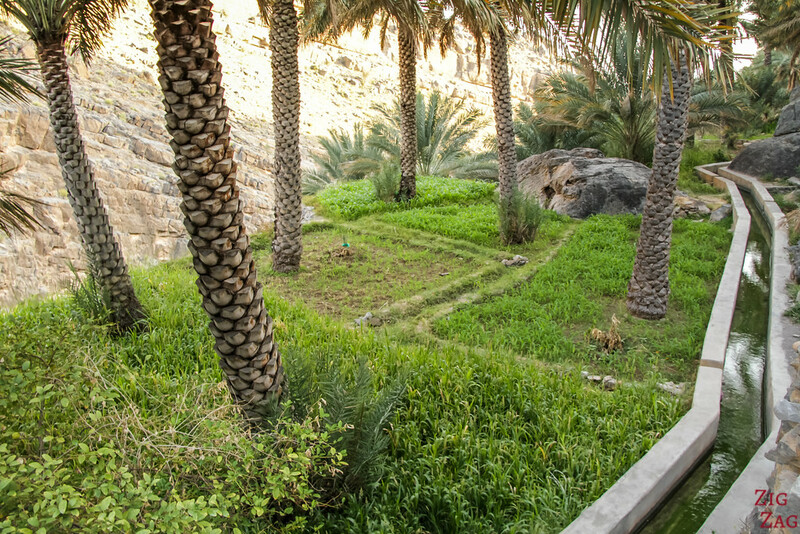 The Misfah old house has rooms in several buildings with shared commodities. My room was in the main one next to the breakfast terrace. The inside is simple but sufficient. It is a great place to sleep has the area is very quiet. I liked the windows surrounded by trees. 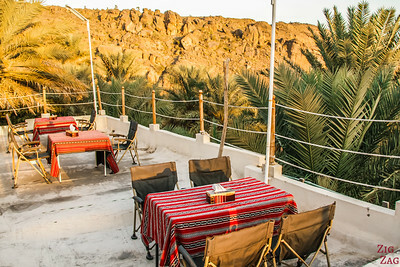 The Misfah old house has a great terrace for dinners on the roof and a more cosy one for breakfast. In the evening I came back from my hike and enjoyed sunset from the roof. 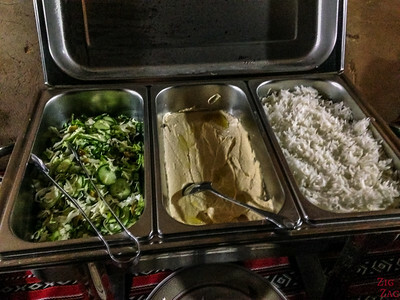 The food at the Misfah Old House was excellent: Soup, fish, vegetables, hummus and a really good cake. 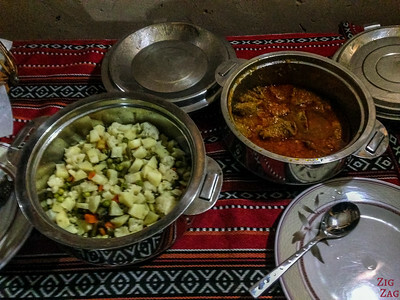 One of the best meals I had in Oman. One of the owner told us his mother had cooked it and he even phoned her to confirm for another guest what fish it was. 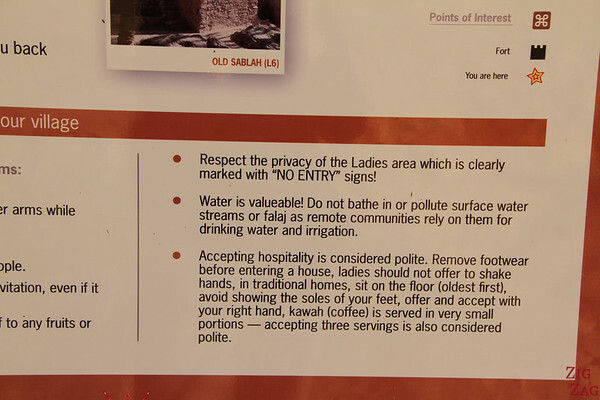 And of course no alcohol allowed. 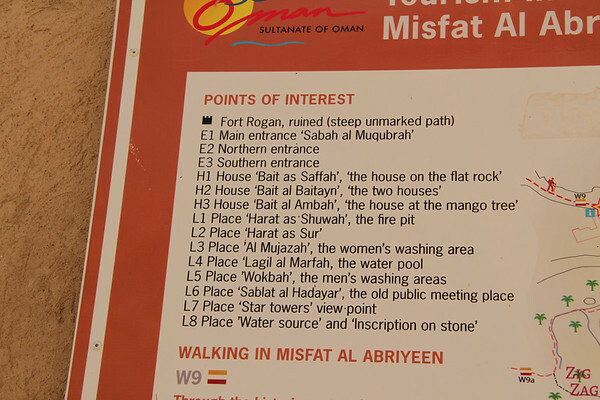 The Misfah Old House does not have its own website. You can use any of the booking platforms such as Booking. 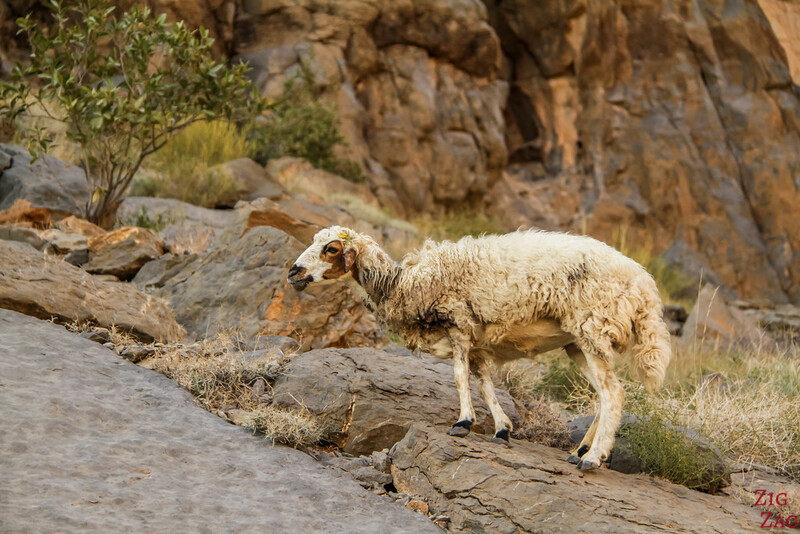 Have you ever crossed path with stubborn animals? Hi Claire! 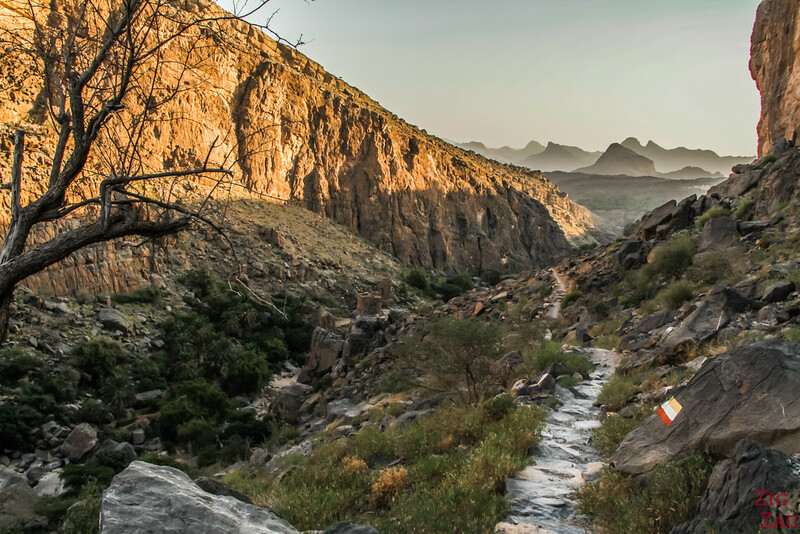 We are planning to do this hike tomorrow, could you please specify the number of hours you took to complete this hike and what is the best time of the day to go? I did not go all the way on the hiking trail. I just walked on the path from the village and turned around when it was getting too late. I walked altogether something like 1h30. 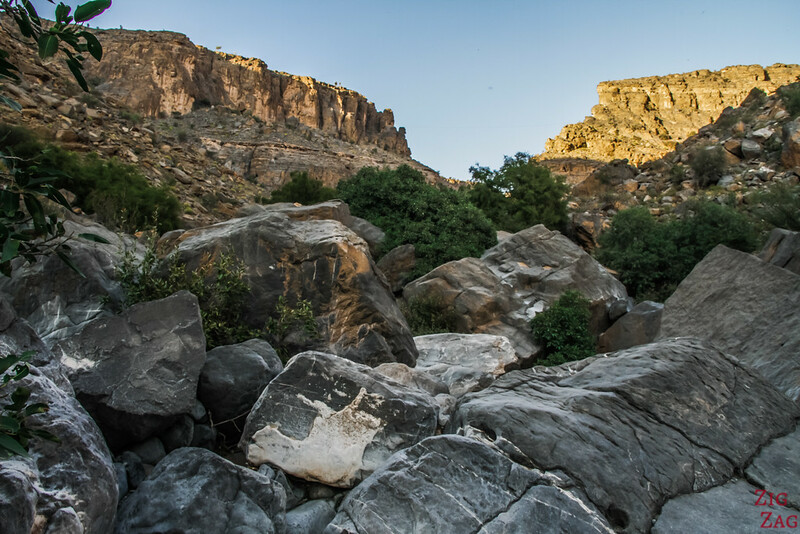 It was great before sunset with the light disappearing from the canyon but be careful to be back before it becomes too dark! Thank You for the reply! Looking forward to the hike!